The new Tacoma's rear brakes are . . .
What, more whining about Toyota? Well, yes. But before you start sending hate mail excoriating me for what’s beginning to seem like continuous criticism of the company, please keep in mind: My first car was a 1971 Toyota Corolla with the little 1600 hemi engine, which I modified to the point that it regularly snacked on BMW 2002s and Datsun 240Zs up Mt. Lemmon Highway in 1:00 a.m. dares. I’ve owned a 1973 FJ40 Land Cruiser for 37 years. Roseann and I have owned four Toyota trucks and two Land Cruiser station wagons. And I have sold uncounted Toyotas through recommendations and reviews. I have extremely high regard for the company. However, that high regard includes high expectations. Karl Ludvigsen titled his encyclopedic history of Porsche Excellence was Expected, and that’s what I expect from Toyota. When I see a company with the engineering might (and profitability) of Toyota coasting on its reputation—and, worse, trying to tell us that cut-rate features are actually “better,” I have to call them on it. The latest issue concerns the rear brakes on the redesigned 2016 Tacoma—Toyota’s mainstay truck in the U.S. and a powerhouse in sales. 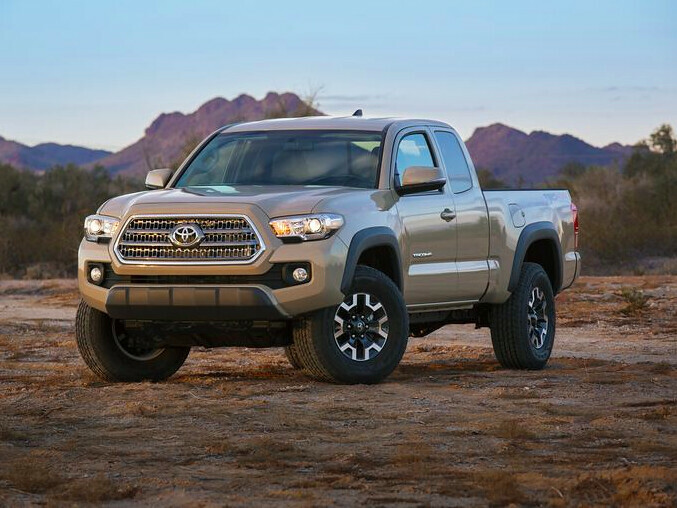 (The Tacoma accounts for between 50 and 65 percent of all mid-size truck sales; the Tundra a dismal five percent of the full-size truck market.) I first saw the new Tacoma in May at Overland Expo West, where the company had a sneak preview of the 2016 truck in the Four Wheel Camper booth (complete with camper). I liked a lot of what I saw. The interior, particularly, seemed more of a piece than that of our 2012. The new 3.5-liter V6 seemed poised to better the 4.0’s power and fuel economy. There were rumors of increased body rigidity due to the use of high-strength steel. Crawl Control and Multi-terrain Select would bring LR4 levels of off-pavement capability to the truck. All very promising. There was one detail I wanted to check (besides the frame, already whined about here). Our 2012 Tacoma came with rear drum brakes—a cheap holdover even at the time, when the Nissan Frontier, for example, had boasted standard four-wheel discs as early as 2008 (as does our 2004 F350). I headed to the back of the new truck and peered through the wheel slots—and saw a cast iron brake drum. I was floored. But I thought, optimistically, Okay, maybe this is still a prototype mule, equipped with some current features that will be updated for production. Surely? The Toyota engineering rep claimed that the only advantage to rear discs—which, he admitted, are more resistant to heat-related fade—is for “heavy towing.” (Note here to you potential mid-size truck customers looking to tow your boat or loaded adventure trailer—or, for that matter, carry a camper: Toyota just implied you should shop elsewhere.) The engineer further claimed that drum brakes expose less of the mechanism to road grit, and are less susceptible to vibration from heat-related warping—this latter referring to brake disc warpage caused by overheating, which can create a shudder felt through the pedal when stopping. Let’s look at these claims. First, Toyota says that discs aren’t necessary in the rear because rear brakes are less susceptible to heat fade than front brakes. The latter is absolutely true. Thus, by their own logic, the statement that rear drums are preferred to forestall possible heat-related vibration makes exactly zero sense, since they already told us that rear brakes are less likely to overheat in the first place. This specious argument would be better used to justify front drum brakes. If you’re having a problem with warping front brake discs, you need to redesign your front brakes, not put drum brakes in back to “reduce vibration.” And if you’re having issues with overheating front brakes, wouldn’t you want the best brakes possible on the rear? Second, the claim that drum brakes are better sealed against debris, for example mud, is actually valid—to a point. Since the brake drum wraps around the shoes, temporary immersion in goop is less likely to let any inside. Disc brakes, on the other hand, can start squealing quickly when dunked in mud (So, again—why not drums in front too, Toyota?). However, once goop impacts itself inside a drum brake, it’s way harder to get out. Ask me how I know. A disc, on the other hand, will quickly clear itself. And were we talking about moisture? Ever driven a vehicle with drum brakes on all four wheels through a stream, then tried them on a downhill section a bit farther on? I remember the first time I did so with my all-drum 1973 FJ40: There were no brakes. It took 20 yards of frantic pumping before the water cooked out of those shoes and I got a faint sense of deceleration. That FJ40 now has discs on all four wheels. If you drive a truck with rear drums through water, your braking will be compromised until they dry out. Any claim that rear drums are “better off road” must either ignore or excuse reduced braking effectiveness after water crossings. 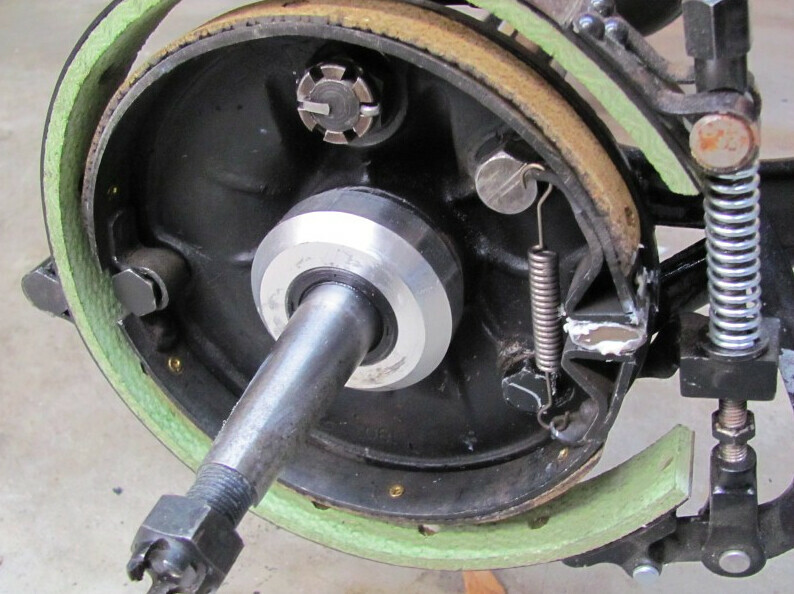 Above: A representative photo of a drum brake. This one happens to be on a Ford Model T . . .
And what about on-road driving, which, let’s be honest, comprises 90 percent of even the most adventurous driver’s mileage? Say, a long, twisting descent off a mountain? In such conditions your front brakes are providing between 60 and 70 percent of your braking force—which means that a minimum of a third of the work is being handled by the rear brakes. If those brakes are drums, which the builder of your truck has admitted are more susceptible to fade than disc brakes, well, again, your braking is compromised. How about maintenance? Anyone who’s serviced both knows that disc brakes are easier to work on, and far easier to check for wear. Are there any incontestible advantages to rear drum brakes? Sure, and you know the answer: cost. And the rear axle is where the vehicle’s parking brake is located. A drum brake does excellent double duty as a parking brake; a disc must usually have a small auxiliary drum to perform parking duties, further adding to the expense. Does this sound alarmist? Am I predicting sure death for anyone stupid enough to buy a truck with rear drum brakes? Of course not. Nevertheless, brakes are the number one safety item on your vehicle. And disc brakes are superior to drum brakes, period. If Toyota wants to continue to economize on this feature in the face of all its competition, fine. Sell us on other features. But don’t try to tell us drum brakes are better. That insults the intelligence of legions of loyal owners, including this one. Newer PostGood people . . .